On this page we will provide angular 2 property binding example. Property binding is a one-way data binding from data source to view target. Property binding is performed with component property, HTML element and angular 2 directives. Component property binding is used for communication between parent and child component because using this binding we can send property values from parent to child component. In element property binding the DOM property of HTML element can be assigned with a value of component property. In directive property binding we can assign component property values to angular 2 directives. Component property binding is performed as below. Element property binding is performed as below. Directive property binding is performed as below. Angular framework ensures content security while displaying data. If we try to display data with <script> tag then it will not allow. Angular filters the data before display. Angular calls such type of coding not only a HTML but HTML Plus because it is more powerful. Now find the complete example of angular 2 property binding step by step using TypeScript. 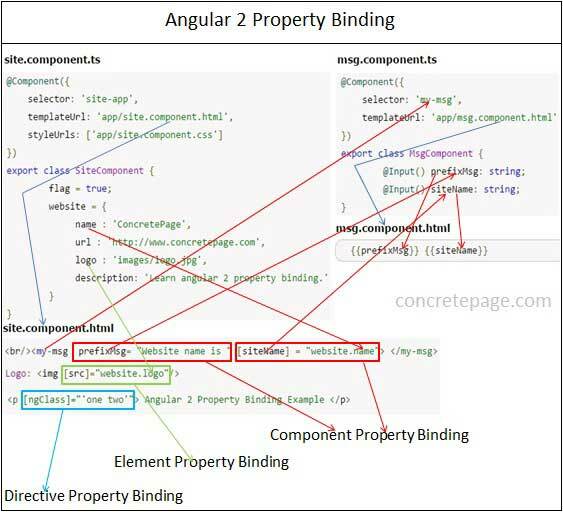 Find the diagram for angular 2 property binding. The description of diagram is as follows. 1. Angular 2 provides three types of property binding and these are component property binding, element property binding and directive property binding. 2. Component property binding works within component element to bind parent component property into child component property. In the diagram the arrows and rectangles in red color are displaying the functionality related to component property binding. 3. Element property binding works within HTML element and it binds a component property to a DOM property. In the diagram the arrows and rectangle in green color are displaying the functionality related to element property binding. 4. Directive property binding works within HTML element with angular directives such as NgClass and NgStyle. 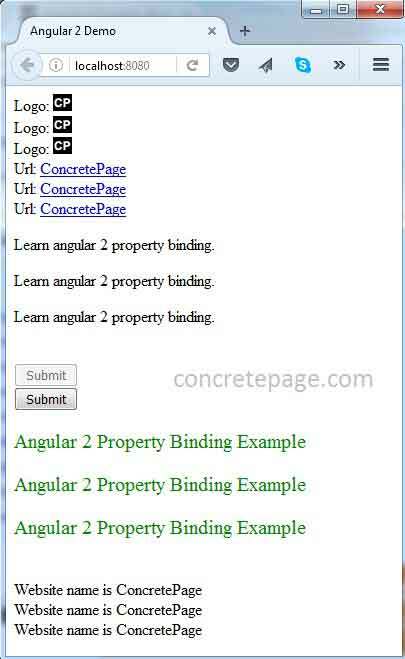 In directive property binding a component property or any angular expression is bound to angular directive. In the diagram the arrows and rectangles in light blue color are displaying the functionality related to directive property binding. 5. In the diagram for the component property binding we have two components. SiteComponent is acting as parent component and MsgComponent is acting as child component. The property website.name from SiteComponent is bound to the property siteName from MsgComponent. So the values of website.name has been copied to siteName. We need to take care that the input property of child component must be decorated with @Input() decorator. The property prefixMsg of MsgComponent has been bound to a constant string using component property binding that is called one-time string initializing. 6. For element property binding demo we are using <img> element. The component property website.logo is getting bound to DOM property src of <img> element. 7. For directive property binding we are using NgClass. We have two CSS classes .one and .two . In <p> element we are bounding these CSS classes to NgClass directive using directive property binding. Property binding is performed as one-way from data source to view target. In property binding there is source and target. For the example we can define it as [href]="website.url". Here href is a target that is a property of anchor tag and source is a component property i.e website.url. In property binding there is source and target. Property binding is performed as one-way from data source to view target. There are three types of property binding. Property binding target will use the below syntax. We can choose any of the above syntax for property binding that fits to our readability point of view. Find the component and its HTML template that is being used in our example. We will discuss here component property binding. Using component property binding parent and child component can communicate. The parent component property as source is bound to child component property as target in component property binding. We will understand component property binding step by step. A. In parent component site.component.ts we have a property as follows. B. For the demo we will send website.name property to child component. Find the child component and its HTML template. We will observe in child component that prefixMsg and siteName properties have been decorated with @Input decorator. @Input is responsible to decorate a component property as input property that will be bound with parent component property to accept values from parent. C. Now for component property binding, in site.component.html we are creating a tag with my-msg that is selector of child component. Component property binding can be performed in following ways. D. In this way website.name property value from site.component.ts has been copied into siteName of msg.component.ts. This is component property binding. We can also perform one-time string initialization. In this type of initialization we do not use [ ], bind- or interpolation. But we need to take care that target will accept string only which is fixed and will not change. In the below code snippet prefixMsg is being used as one-time string initialization. Here we will discuss HTML element property binding. Find the property binding in HTML element <img>, <a>, <p> and <button>. The targets such as src, href, textContent and disabled properties has been enclosed within bracket [ ]. Source is a component property. The src of <img> tag has been assigned with the value of website.logo. In the same way href of anchor tag has been assigned with value of website.url and textContent has been assigned with the value of website.name and same in <p> tag. In Angular framework disabled property can be assigned with true and false value which in normal HTML coding it does not work. Find the element property using bind-. We just have to add it as prefix with element properties as follows. Now find the element property binding using interpolation. Property binding can also be achieved for angular 2 directives. In our example we are using ngClass directive. We are assigning CSS classes. For the example we have two CSS classes i.e. .one and .two. Find the directive property binding using [ ]. Find the directive property binding using bind-. Find the directive property binding using interpolation. Template binding works with properties and events but not attributes. In angular framework, attribute binding is achieved using prefix attr. such as [attr.colspan]. Let us understand the differences between HTML attribute and DOM property. 1. Attributes are defined by HTML and properties are defined by DOM. 2. The responsibility of HTML attributes is just to initialize DOM properties. And then later DOM properties can change but HTML attributes cannot. 3. There are some HTML attributes that have corresponding DOM property and those DOM properties have corresponding HTML attributes such as id. 4. There are also some HTML attributes that do not have corresponding DOM property such as colspan. 5. There are also some DOM properties that do not have corresponding HTML attributes such as textContent. 6. The HTML attribute value contains initial value whereas DOM property value contains current value.